Having two good friends come into town during the same week has me feeling a bit greedy. I don’t want them to leave but do appreciate the time we have together. 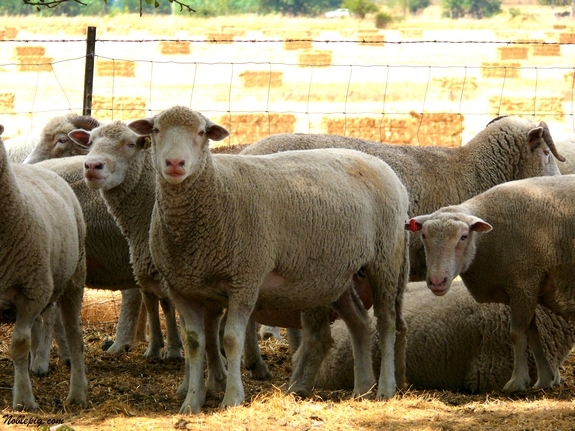 Yesterday we were lucky enough to visit with our California friends Paul and Tarri (before they make their way to our house) at their aunt’s farm in Lebanon, Oregon. We had the best time ever. You know who had an even better time? …and riding on what I swear was at least 357 bikes, trikes, tractors, scooters and carts. 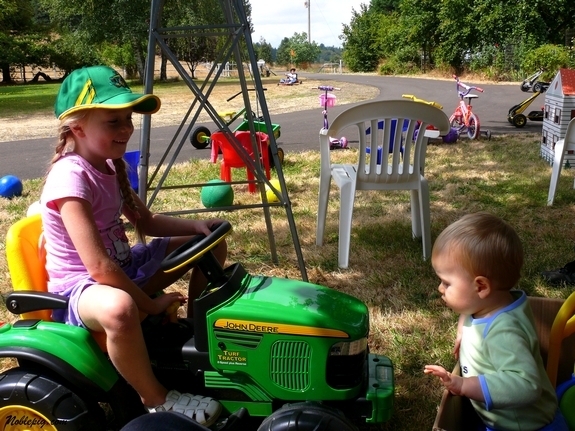 Matching John Deere’s anyone? See…more carts and racer-around-thingys. I’m amazed I even got these pictures. I barely saw the kids all day. This however was my oldest son’s happiest day. 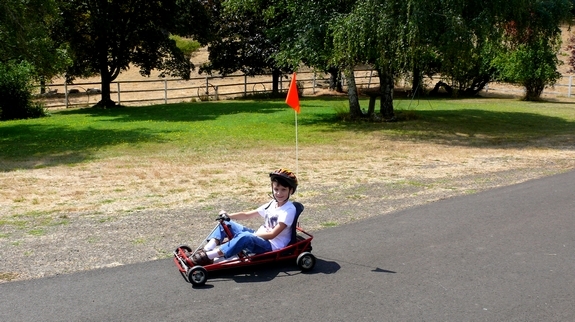 A 12 mph go-cart that only he could use since he was old enough. No cars to worry about…he was loving it. He zoomed around for hours and hours. The only pigs on this farm. Baby lambs born moments before and trying to stand for the first time. 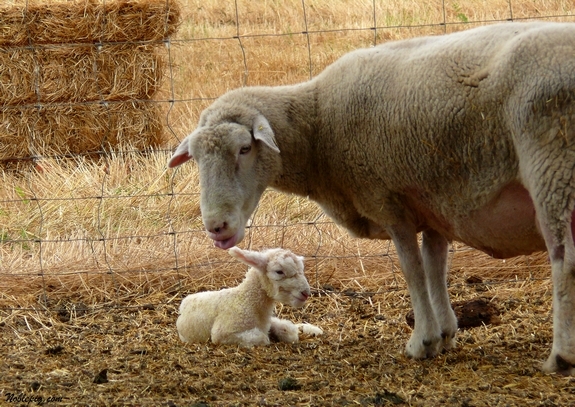 Our kids faces as they watched these lambs emerge into life…priceless. The world needs to smile more. I suspect there’s not many people who wouldn’t smile at the pictures of the lambs! It’s amazing what magic children bring to a scene, when they see something for the first time, that feeling of awe and joy leaches out and infects those around. Then we all get a glimpse of seeing it again as if for the first time. These are what you might well conclude as some of the best times of your life! So much more fun and adventure with the most important people in your life yet to come. I so like seeing you are enjoying and savoring these moments your children are enjoying. And to get to see the new babies, too. Oh what gorgeous lovely photos. So beautiful, and such happy children. 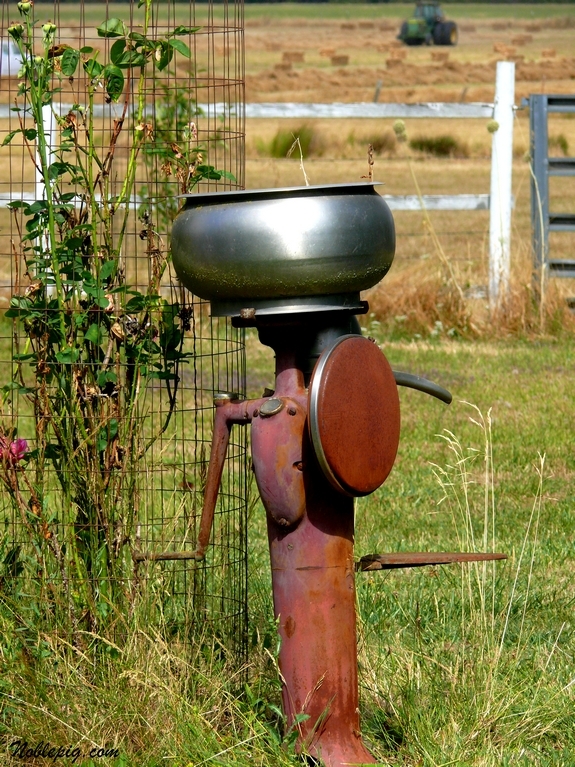 A trip to a farm like that beats going to an amusement park or arcade any day! Quality activities and fun like that is hard to find these days. Fantastic photos of the young ones. I was left with a feeling of bonding with mother nature after reading this post! It sounds like a day made in heaven for the kids and kids at heart. Great pics! Looks like fun! My boys would love all the carts and drive-around-thingys. oh wow Cathy those are some amazing photos. Your kids were very lucky to witness the new babies. And I know what you mean about having a safe place for kids to run, makes all the difference in the world. Yep, that’s how we humans birth babies…shoot ’em out like there’s nothing to it, and go right on eating! BUT, what a great life moment for the kiddies! You know? I don’t see one teeny tiny down-side to this move of yours. Not one! Brilliant .. wonderful pictures .. such happy memories and what a fabulous time .. can I please come over and go back 50+ years!!! I’d love to play with those trucks on the farm … oh oh oh – I missed out! Fabulous – glad everyone is having such a fantastic time. What an awesome day! The pictures are so great. Cool things to ride AND baby lambs? How cool is that? It looks like everyone – kids and adults – had a fabulous time! I’m so happy you are having such a nice time with your friends! The photos are beyond wonderful and I’m sure the memories are even better. Wow. What a beautiful day with beautiful kids and just an amazing life you are leading. So glad you are enjoying your visitors. What a glorious fun day! Your pictures are amazing. This looks like absolute heaven to me! I wish I could start life over when I see photos like this! You are truly fitting in to the Oregon lifestyle. Looks like a great time with friends! How wonderful that you guys are getting to make all these memories with your kids and friends together! I love looking at the kids having fun OUTSIDE just being kids! 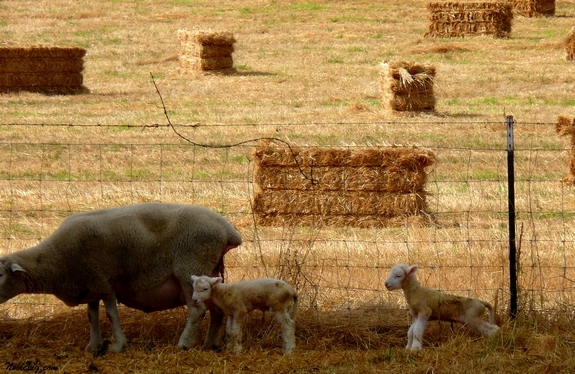 And, those baby lambs … soooo cute! Sounds like you guys are having a great visit (and summer)! 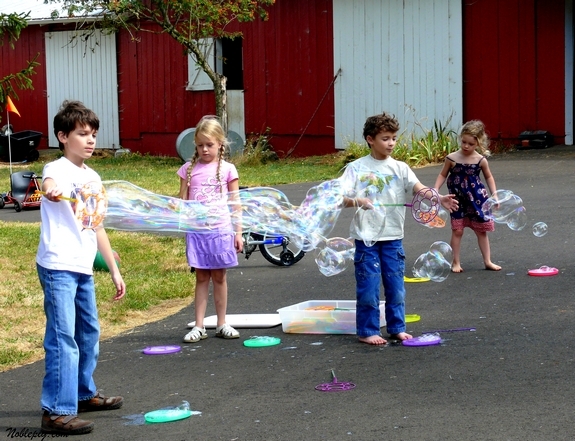 I totally forgot about those big bubble makers! Hannah used to love that when she was little. well now you are really living the good life. So which do you prefer, fancy drinks by the poolside or tractors and new baby lambs? The country life seems to be a good match for all of you. Yeah, ok you can like both. 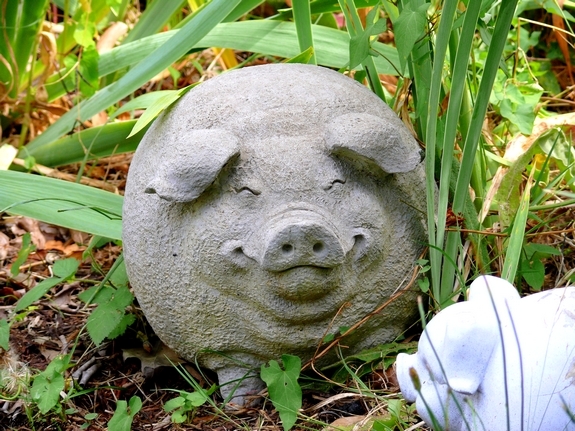 You need one of those concrete pigs for your place. What great fun! Those lambs are so very cute. And I love the bubbles. My kids are too old to my excuse for playing with that kind of stuff anymore. I LOVE the bubble picture! What fun! I can’t imagine all the shenanigans I would’ve gotten into as a child with all the room to run around! I can’t say enough good things about living in the country. Looks like all the kids had a wonderful time, grownup too. Great pictures. Heaven! That’s where my daughter, who’s 12, would be if she were there….Makes me think I should listen to her and move to the country. Wish I were there. It would make me feel like a kid again. What fun! Cathy, what a great day!! I love when you go to a party and your kids are just free to have fun and goof off like that. I loved the pictures. 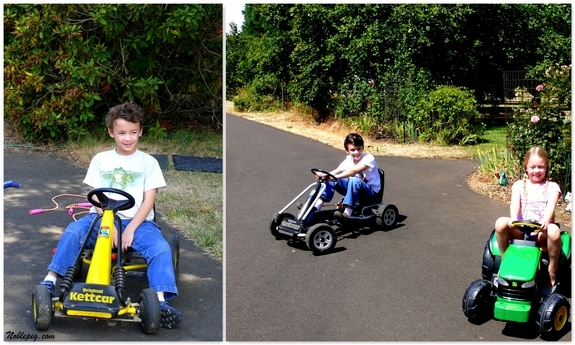 I think my sons would have dug the go-carts too! Oh, gosh — what a gorgeous farm. 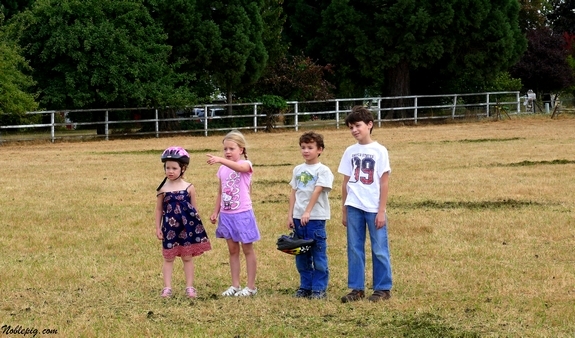 Looks like your kids had a fabulous time… what a great way to let them just be kids! Looks like the kids had so much fun! Great photos! Those lambs are too precious! And so are those children! 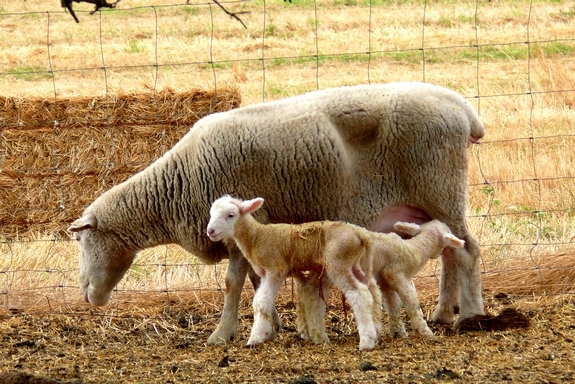 Brand new lambs – too cute. It looks like you guys (especially the kids) had a great day. 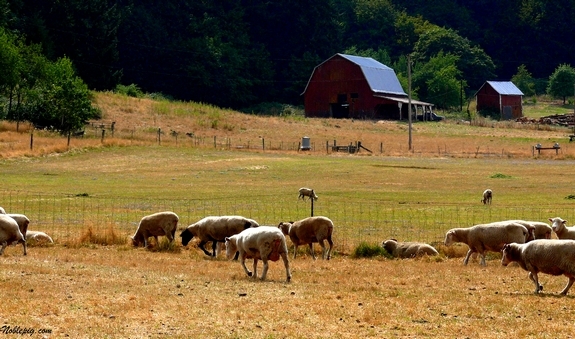 Don’t you love the Oregon countryside? The kids must have been in paradise. It looks like a working farm as well. What a great day you all must have had. Oh this is just a dream. Seriously. I really want to live on a farm one day. This is just idyllic. Kids being occupied all day and baby lambs being born? Sounds like heaven! These pictures are so sweet. I especially love the sheep/lambs. And I guess your kids are pretty cute too! The pictures and the occasion are like something out of ‘Life’ magazine or National Geographic. What a wonderful time! 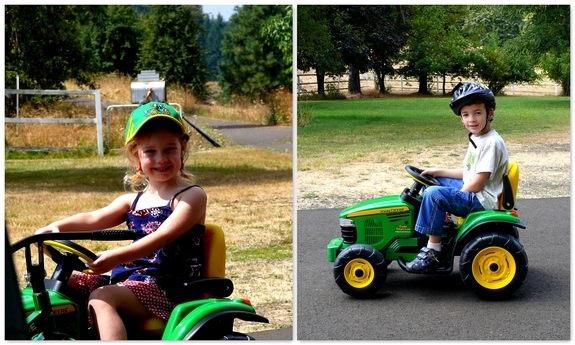 Oh man, I want to drive a John Deere! I love to live at your place, so peaceful and calm. I love to see the kids laughing and having fun. Nice photos! What a superb shot. Those sheep are so sweet…the newborns just starting to walk….